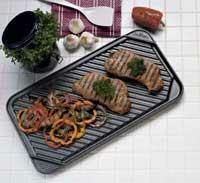 • Accommodates extra large cuts of beef, pork and poultry with its generous base and high dome cover. It also fries, grills, roasts, stews and cooks casseroles. 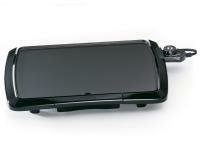 • The EverNu cover is so durable, it won't dent, warp, bend or peel. • Heavy cast aluminum base is virtually warp-proof. • Accurate cooking temperatures are maintained with the Control Master heat control. 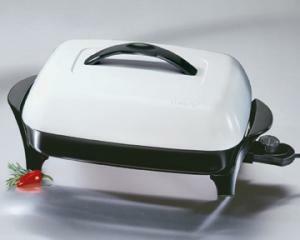 • Skillet is immersible and dishwasher safe with the heat control removed. Very nice skillet. Large enough to do everything I want to do in an electric skillet. Non-stick surface is great! I love the large capacity of this electric skillet. My old one was about seven years old. I liked it so much I replaced it with a newer model. This is a great item. The delivery was fast and safe. Thanks! A great kitchen help and easy cleanup. So far it is great. It arrived it perfect condition. This skillet is one that everyone should own if you cook for more than 2. I like the size and depth of the skillet especially with the high lid. Only used it a few times but was very happy with the final result.